The main difference this time around is Towson has elevated their 6th and 7th men, Alex Thomas and Jakigh Dottin, into the starting lineup. Tobias Howard and Nakye Sanders are now bench options. I'll leave any additional analysis to HAWKING. You set the bar too high my friend. Nobody's going to like my analytics. It's just another game we should win at home. Oh come on Hawking! I for one enjoy your analytics... Post them! Beg to differ. We’ve all quickly come to enjoy your analytics even if we disagree it provides us fresh ideas and points of discussion. I for one, was excited for the SN08/Hawking collaboration. I can't fathom how they managed to win @ Delaware and vs. Northeastern in back to back games. (01-29-2019 02:11 PM)Seahawk Nation 08 Wrote: I can't fathom how they managed to win @ Delaware and vs. Northeastern in back to back games. Its the CAA, man. Weird stuff happens that never makes sense. WILMINGTON, North Carolina – UNCW begins its second time around the CAA men's basketball carousel this week when Towson and James Madison visit the Port City to close out a four-game home stand for the Seahawks. The Seahawks (8-14, 4-5) and Tigers (7-15, 3-6) square off for the second time this season in a 7 p.m. tip-off on Thursday, Jan. 31, 2019. UNCW edged Towson, 67-61, back on Jan. 5 at SECU Arena. Live Seahawk Digital Network (SDN) coverage of the UNCW-TU contest kicks off at 6:45 p.m. with Mike Vaccaro, the "Voice of the Seahawks," and color analyst Marty Feurer on the call. Visit UNCWsports.com/SDN for live audio coverage. UNCW is tied for fifth place in the circuit with Drexel. Hofstra sits alone at the top with an unblemished 9-0 record, followed by Delaware (6-3), Northeastern (6-3) and Charleston (5-4). UNCW and Drexel share fifth place with identical 4-5 records. In their last appearance, the Seahawks fell behind early and never caught up to Elon as the Phoenix fashioned an 89-82 victory last Saturday at Trask Coliseum. Senior forward Tyler Seibring poured in a career-high 32 points on 12-of-16 shooting and senior guard Steven Santa Ana added 24 points to help Elon win for the first time at Trask Coliseum. Towson had its modest two-game winning streak snapped last Saturday when Hofstra's high-octane Pride breezed past the Tigers, 84-61. The Tigers are 3-5 away from SECU Arena this season. The last UNCW-Towson game at Trask Coliseum was a memorable one. UNCW erased a 12-point deficit with 11:57 remaining to stun Towson, 73-71, in an overtime thriller on Jan. 20, 2018. Senior point guard Jordon Talley dropped in a pair of free throws with four seconds left in regulation to force overtime and the Seahawks survived a last-second shot by Towson's Brian Starr to gain a split of the regular season series with the Tigers. Seahawk freshman point guard Kai Toews was named CAA Rookie of the Week for the third time on Monday, giving the Seahawks four weekly honors this year. The Tokyo native averaged 18.0 points, 5.0 rebounds and 9.5 assists and racked up his fifth double-double of the season with 13 points and 12 rebounds against the Phoenix. In addition, last week was another outstanding one for senior forward Devontae Cacok. The All-CAA First-Teamer averaged 21.0 points, 17.5 rebounds and 4.5 steals in two games, shooting 68 percent (17-of-25) from the field and 80 percent (8-of-10) at free throw line. He is averaging 15.9 points and 12.2 rebounds per game overall and 19.0 points and 14.6 rebounds per contest in CAA play. 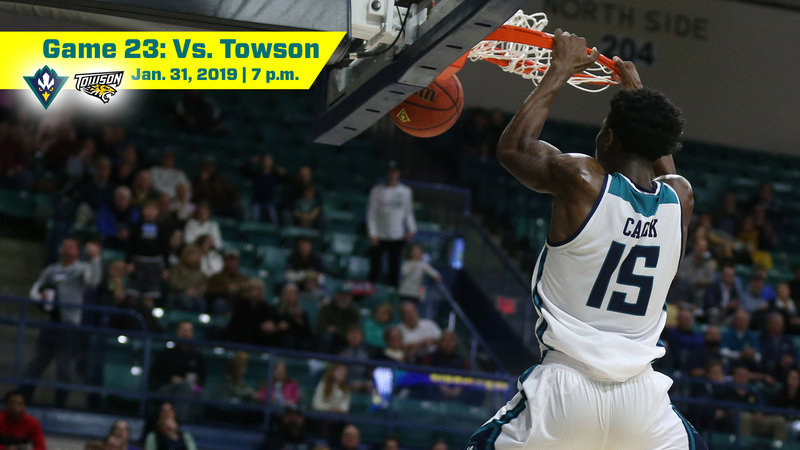 THE SERIES: UNCW and Towson are meeting for the 40th time on Thursday night and the 17th time at Trask Coliseum. The Seahawks own a 24-15 advantage in the series and have won 14 of the 16 games in Wilmington. UNCW has taken five of the last six meetings between the two schools and eight of the last 10 pairings. BOARD GAMES: Tonight's game features the CAA's top two rebounding clubs. Towson leads the loop with a rebounding margin of +5.9 while UNCW ranks second at +4.3. NATIONAL NUMBERS: According to this week's NCAA statistics, Devontae Cacok leads the nation in double-doubles (16) and total rebounds (268) while ranking second in rebounds per game (12.2) and third in offensive rebounds per game (4.36). CACOK NOW THIRD: Devontae Cacok has risen to third on the CAA's all-time rebounding list, trailing only Navy's David Robinson (1,314) and Hofstra's Rokas Gustys (1,305). Three of the CAA's top-10 rebounders are Seahawks. TOEWS CLIMBS SEASON LIST: With 172 helpers, Kai Toews has tied all-time great John Goldsberry for fifth on the single season assist list. NEXT UP: Following Thursday's clash with the Tigers, the Seahawks return to Trask Coliseum on Saturday for the annual Homecoming game vs. James Madison. Tip-off is 7 p.m.
We need a strong fan showing to get us in the W column for this one. (01-31-2019 08:27 AM)Seahawksilver Wrote: We need a strong fan showing to get us in the W column for this one. It's Homecoming. I think we'll get our wish. Spread is us by 4.5 & over/under is 147.5. This has come to a must win game. This home stretch was the easy part of our schedule and we can't afford to go less than 3-1. Our remaining home games will be against the toughest teams in the conference. (01-31-2019 08:43 AM)82hawk Wrote: This has come to a must win game. This home stretch was the easy part of our schedule and we can't afford to go less than 3-1. Our remaining home games will be against the toughest teams in the conference. What can we count on at this point? Used to be able to count on a home win at Trask. I would say despite the record the players look more comfortable at home as opposed to feeling the pressure of winning at home. But losing to any team is possible when you can't hang your hat on defense. There will be no change today in our defensive scheme for sure. We can at least count on that. However, we CAN outscore teams towards a win so there is hope. Unfortunately I think Towson will clamp down on Cacock in the paint and again unfortunately I think the game plan is to force feed Cacok instead of getting him touches on Pick & Roll dive while Toews looks for that or the lift man (3pt). Cacok will not get points today in a post up situation. We need players to hit a lot of threes since,much to most fans chagrin, they won't drive other than Toews. Here's hoping we find our stroke against Towson and force them away from Cacok. Go Hawks. Sean O'Connell had his best game of the season up at Towson, he'll be a key player tonight for his rebounding. I know he was battling some kind of sickness last week, hopefully he's good to go for this one. Ensure Gadsden gets going early and it will force Towson to overplay him and potentially free up Cacok. Toews working his magic dishing and driving may also free up Cacok. Agree on the defensive scheme likely being more of what we've constantly seen so I don't see any reason to belabor that point. We all know what we'd like to see, and we all know what we're probably going to see. So, just as you said, we're going to really rely on some big offense here. (01-31-2019 09:57 AM)Gary Miller Wrote: Sean O'Connell had his best game of the season up at Towson, he'll be a key player tonight for his rebounding. I know he was battling some kind of sickness last week, hopefully he's good to go for this one. Looks like he is nursing a back injury or something. He has his back worked on before every game. CB mentioned a sickness last week... Hopefully the back is just minor wear and tear from the season.